Now, you might ask yourself "a page about making a pair of headlamp stays???" 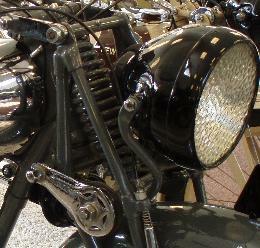 Well, if I hadn't set my mind on having the lovely curved headlamp stays that grace the machine in the National Motorcycle Museum it might just have been a matter of bending and drilling two strips of flat iron bar. And, to be honest, I am not sure what the original stays looked like. 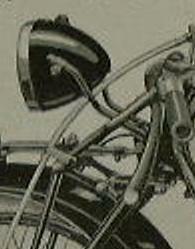 In some catalogue pictures the look just like those metal strips, but at least the earlier bikes with the leaf-sprung forks had something like these curved struts. So, this is more or less a page about making struts from thin-walled tube, or about flattening tube-ends. If you have ever tried to flatten the end of a tube with a view of drilling a hole through it and fastening it with a bolt you know that pinching the end in the vice just won't do. Looking at such pipe ends on properly manufactured items, you notice that they have been made with some tooling, and that the flattened end is thicker than just two times the pipe wall thickness. The two tools shown here produce a quite nice tube end. (Sorry, the half-round cutout in the top one is meaningless - it was just in the piece of metal I found!). And if you work with thin-walled tube, it is as well to insert a short length of suitable smaller tubing into the end before flattening it. All you need to do now is align the two tools and the pipe nicely in a sturdy vice. I have to admit that building two guiding pins into the tool would make this much easier - maybe next time. After rounding the ends off a little it looks like this. Now you cannot fill a tube thus prepared with sand. So I needed another tool to bend it. I know I should have turned a shaper with a nice half-round groove as wide as the tube diameter, but I did not have a big enough slab of metal. However, I found a pipe flange of the right size, which was a bit wider than the pipe diameter. I turned this to be as thick as the pipe and clamped it between two steel plates, thus forming a square channel of the correct bending radius. This allowed the tube to be bent without getting much out of round. I found that heating the section to be bent to dull red makes things much easier. .. and this is how it looks on the bike.